Symmetry in Rome. Piazza del Popolo. 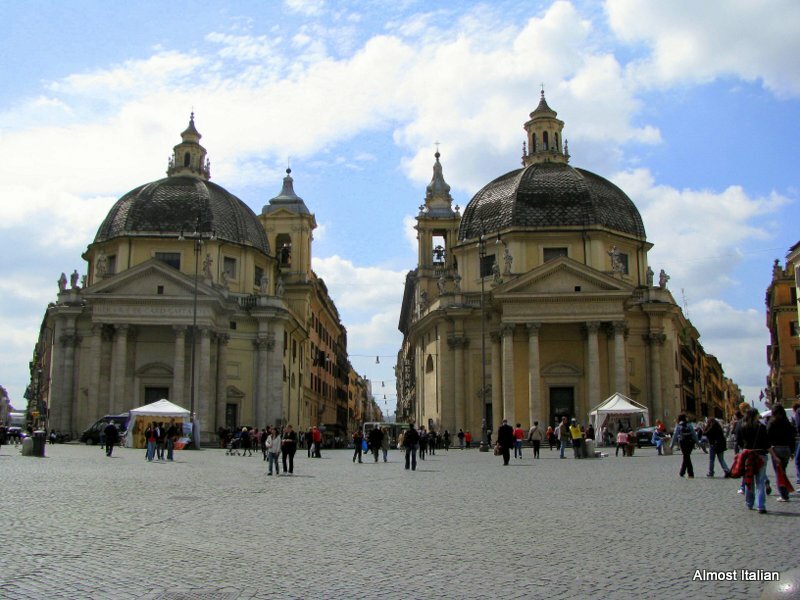 Wonderful symmetrical balance in the Baroque manner can be seen in the Piazza del Popolo in Rome. Le chiese gemelle (the twin churches) of Santa Maria dei Miracoli (1681) and Santa Maria in Montesanto (1679), begun by Carlo Rainaldi and completed by Bernini and Carlo Fontana, define the junctions of the three roads, with Via del Corso running through the centre of the trident. It is a stunning piazza. Yes, since you are only a small hop away, via a rather expensive tunnel. Note that it’s not completely symmetrical – the inner angles between the three streets are not quite the same and one the churches is thus smaller than the other. Yes, there are many asymmetrical features which add to the fascination of something that initially appears to be symmetrical but isn’t. Gemelli but not identical gemelli. When I first saw these two churches, I felt like they were spaceships landing in a neoclassical piazza. Just catch the train from central Rome to get to this wonderful Piazza. All around the Piazza are many baroque gems. It is a wonderful spot, Gianluca, I could sit there all day and watch the world go by. Next Next post: Did the Earth Move for You Too? Transformation.